We’re getting to the bottom of the barrel final forms here. There are many glaring problems with Scyther, most of which have already been covered for other Pokemon, but redundancy is the only way to give any sort of analysis to this thing. One, the movepool. Okay, yeah, Normal type moves and Wing Attack. Wing Attack only had 35 power back in RBY, so just say no to that. Scyther doesn’t have access to Body Slam, so even though Scyther uses Swords Dance, it needs to rely on Slash (which I must remind you, is not boosted). Double Edge is an option, sure, but Scyther is so very, very frail that its not a good idea. Speaking of which, the typing (same as Butterfree’s) has 6 glaring problems. Weakness to Flying, Fire, Ice, Electric, Poison and a double weakness to Rock. The defensive spread of 70/80/55 is frail, especially on the Special side. So its not good defensively then either. There are limited good things about Scyther. 110 Attack and 100 Speed give it a niche of being able to sweep opponents with Hyper Beam. Of course Hyper Beam has that nasty drawback of “MUST RECHARGE!” however, so again, use at your own discretion. Or don’t, because Scyther isn’t worth it. It’s rare, hard to catch, comes at the Safari, outclassed by every other Physical sweeper on the list above it, and its so very frail. Avoid. Yeahhhhh you already saw the problem with the worst fully evolved RBY electric type I’m sure. Offense consists of Thunderbolt and Hyper Beam. And that’s it. 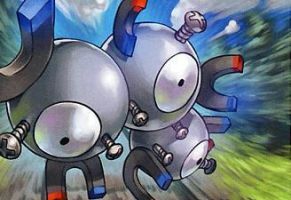 There’s always the options of Swift (yahoo) and Double Edge, but Magneton doesn’t have much HP for the latter, so its not a good idea. Besides, both of those run off the inferior attack stat of 60, and Thunderbolt (and Thunder, but don’t use both) is the only move to run off its really nice 120 Special. Defenses are at 95 and 120, but as said before, it doesn’t have much HP to back it up, at base 50. So although its a good defensive typing, be prepared to get knocked out a time or two from mediocre hits. The support moves range from good (Thunder Wave) to filler (Supersonic) and Magnemite comes at a point where you can Zapdos, or Electabuzz, or Raichu, or Electrode, or ANY other Electric type in the game. So that being said, don’t use it. There is zero upside compared to any of the aforementioned Pokemon, zero.